A beautiful circa 1900 arts & crafts Scottish copper and oak mirror. This arts & crafts copper mirror comprises of a solid oak frame, with beaten copper decoration, and thistles and heather design. Our arts & crafts copper mirror has a large mirror to centre, and is in lovely condition for its age. You must appreciate, there is some wear and tear to the glass which is clearly shown in the photographs. We have not replaced this (although it can be replaced at no additional cost). 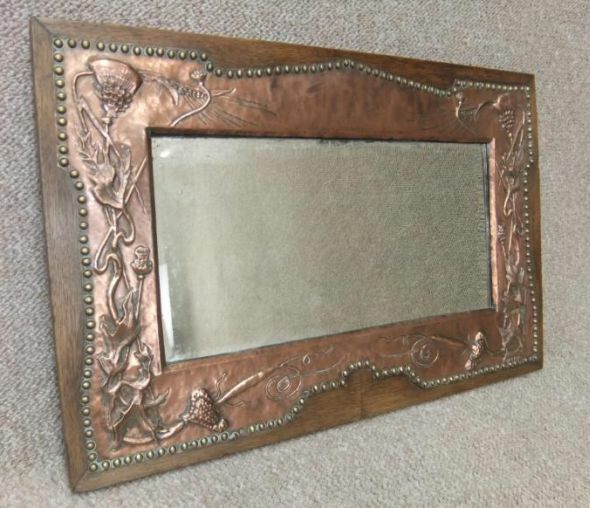 Please do not hesitate to contact us if you would like to come and view this arts & crafts copper mirror; it is available to look at in our large and extensive showroom.